COLLECTS YOUR SPILLS - If you're Mixing Cocktails, Making Coffee, or even Pouring Beer from a tap spills are going to happen. Keep your drips and spills contained in an easy to clean mat. NON-SLIP MATERIAL - Will stay firmly in place on your counters, tables, and of course bar tops. MULTI-PURPOSE - Made for a bar service area, but also works great in the office coffee break area, on kitchen counters, or even for your pet's food and water bowls. 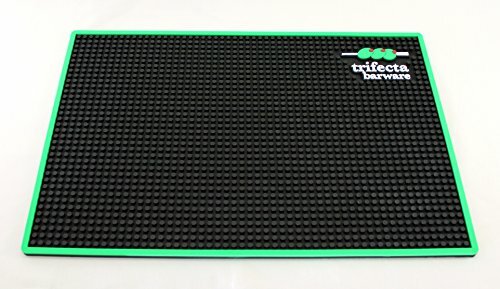 SURFACE PROTECTION - This strong and durable material will protect your high traffic counter and bar areas from unnecessary wear and tear. EASY CLEANUP - Simple to clean rubber mat that will dry out quick. If you have any questions about this product by Trifecta Barware, contact us by completing and submitting the form below. If you are looking for a specif part number, please include it with your message.